A Brand New Level of Luxe is happening for Lori Waddell Photography in 2016! We are so excited to announce our brand relaunch coming early in 2016! Along with the relaunch, we will be introducing our new level of luxe sessions that we will be offering in 2016. Our new level of luxe sessions have been in the works for several months now and it is time to finally introduce one of them. If you have followed us for several years, you may have noticed Lori Waddell Photography was the original photographer in the area to bring you the most sought after Boutique Style Senior Session and now we are the first in the area to bring you a never seen before Prom Day Photography Session (details about this session posted below)! Our Prom Day Photography Session is taking prom photography to a whole new level of luxe! In celebration of our relaunch, we are having an amazing contest on instagram, you do not want to miss out on! If you are a current Junior or Senior girl attending high school in the metro Atlanta area, we want to see you enter, because one lucky girl is going to win this amazing photography session (details on how to enter posted below). WHAT IS THE PROM DAY PHOTOGRAPHY SESSION? This is taking prom photography to the next level! Think about all the attention a bride gets on her wedding day. This is the same attention to detail you will be given on your prom day! Your Prom Day Photography Session will consist of up to 6 hours coverage starting at your home as you are getting everything ready for your day. We will then travel to your salon to photograph your hair being styled and makeup being applied. After you are all dolled up and ready, we will have a short mini session before we head to meet your group of friends. Once we arrive at the location (where your group is meeting), we will photograph you with your group before you head off to dinner and to your prom! You will receive the digital images taken from your Prom Day Photography Session on a gorgeous engraved crystal flash drive inside a luxurious storage box! Additional coverage is available to purchase if you wish to have photographs taken at the restaurant as well as at your prom. 1. You must obtain permission from your parent(s) to enter. 2. You must be a current Junior or Senior girl attending high school in the metro Atlanta area. 3. Follow lori_waddell on Instagram. 4. Grab the sharable image (as seen below) on lori_waddell instagram account and in the comments you must tag @lori_waddell and use #lwppromdaygiveaway (Your account must be public in order for your entry to count). HOW ARE THE ENTRIES COUNTED? Your Instagram account must be public in order for your entry to count. You can share the image once a week to increase your chance of winning. All entries must be received by December 30th, 2015 at midnight EST. A random number will be drawn and the winner will be announced on lori_waddell instagram account on New Year’s Eve! If your name is announced as the winner, you will have 24 hours to contact us at lori@loriwaddellphotography.com. Failure to contact us within the 24 hour time frame and/or failure to send your signed parent permission and prom photography contract form to us within 3 days will result in forfeiture of your win. Should you forfeit your win, a second drawing will be held and a new Prom Day Photography winner will be announced. Your prom session must take place before May 15, 2016. 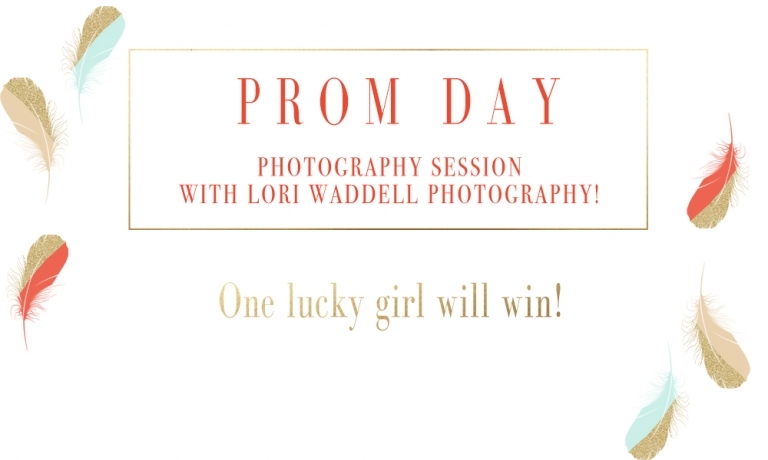 This Prom Day Photography Session cannot be redeemed for cash, nor can it be exchanged for any other session offered by Lori Waddell Photography. Same rules will apply for the second drawing and any thereafter. Lori Waddell Photography is an Award Winning photographer who is Published Nationally in several print magazines across the nation. LWP is the most sought after senior portrait photographer in the metro Atlanta and widely recognized for the Boutique Style Senior Portrait Experience. LWP is currently (but not limited to) photographing seniors attending Greater Atlanta Christian, Lovett, Walker, Blessed Trinity Catholic, Westminster, Pace Academy, Milton High, Roswell High, Dunwoody High, Woodward Academy, Mount Paran Christian, Kennesaw Mountain, Roswell, and Harrison.